Interfaith Family Shelter | Introducing a new logo! Interfaith Family Shelter | Introducing a new logo! Interfaith Family Shelter is rolling out a new brand, including a fresh logo! We hope you agree that it helps to convey what Interfaith Family Shelter has come to stand for since its inception more than 30 years ago: sheltering families and strengthening community. The new look is effective both in print and digital formats and will be an important tool to help expand awareness and visibility of our mission and impact. 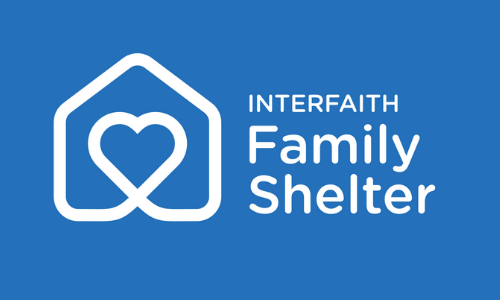 You can expect to see the new logo appear on Interfaith Family Shelter’s email and newsletter mailings, social media platforms (do you follow “Interfaith Family Shelter” on Facebook? ), and on the website. All of the print materials and official documents are getting upgraded with the new look, as well. This new look also marks a new phase of growth and enrichment for Interfaith Family Shelter. In fact, this is just the first of many exciting updates underway. Did you know that the number of families coming through the shelter and transitioning to a stable home is growing? Rest assured that while the outward image is refreshed, the core services and commitment to families remains the same. We hope you take pride in your connection to Interfaith Family Shelter and look forward to new ways to be support and be involved. Stay tuned for more soon!